If you're interested in enhancing your home's energy efficiency, new replacement windows are a good place to start. Inefficient windows will let heating and cooling escape your home and can be costly. From upgrading your window frames to repairing broken glass, nearly any type of window care and repair will improve the situation. Whether you are restoring house windows or updating them completely, Modernize is here to help you find replacement windows in Peoria, IL. We will connect you with local trusted contractors that will give you essential information on where to start upgrading your home's windows. We are proud of what we do. We want to connect our homeowners to the best local window contractors in a quick and easy process. Search our list of trusted contractors in your area today! Get free quotes from the best window replacement contractors in Peoria, IL, ready to complete your project. There are a few sure signs it is time to make plans to replace the windows in your home. For instance, if your windows are becoming difficult to operate, or if air is leaking in through the windows and causing drafts in your home. You should also consider replacing your windows if they are 15 years or older, as the energy efficiency of most windows begins to decline at this point. Before you get started making window purchases, there are a few factors to consider that should influence your buying decisions. Since windows replacements are costly, with each window costing anywhere between $450 and $1000 to buy and install, it is important to be sure you are selecting the right windows for your home. The main thing to consider before making a purchase is the climate in Peoria, taking into account not only the changing temperatures but also the rainfall, snowfall, and any severe weather that occurs in your region. Additionally, each city typically has unique building codes that may require you submit a permit application before beginning your home improvement project. In this window guide, you will find the information you need to select the windows most suited to your home and to be sure you are following all city legal requirements in Peoria. 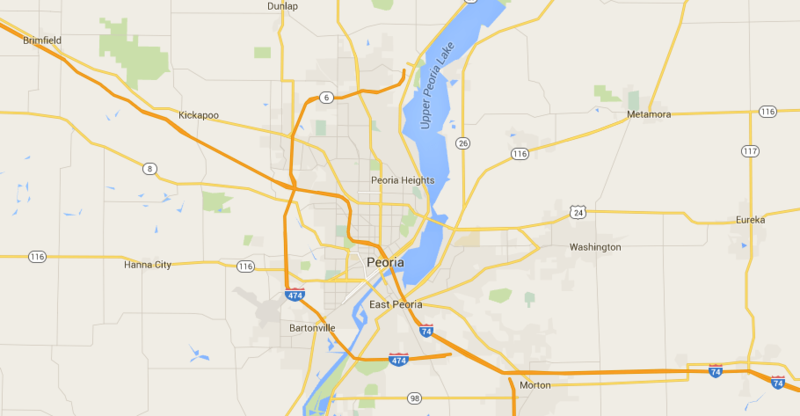 Since Peoria is located in the Midwest, you experience a wide range of weather over the course of a year. Not only are your summers warm, with an average high of 86 degrees in July, but your winters are also cold and snowy, with an average low temperature of 17 degrees in January. Peoria receives 25 inches of snow and 36.45 inches of rain each year, a little more than national average. Illinois also experiences a fair amount of extreme weather, receiving an average of 35 tornadoes each year. Because of the variances in weather experienced in Peoria, you can expect to rely heavily on both your air conditioner and heater to keep your home comfortable over the course of a year. Heavy use of your HVAC system can be costly and can have negative consequences on the environment, since the energy used to power your HVAC unit is derived from non-sustainable resources. Purchasing energy efficiency windows, specifically manufactured for a climate like Peoria’s, is one way to lower your year heating and cooling bills and to decrease your consumption of nonrenewable energy. On each window, you will find a National Fenestration Ratings Council label that can guide your search for windows most appropriate for your climate. On the label, ENERGY STAR® provides both U-factor and Solar Heat Gain Coefficient ratings for that specific window. The U-factor rating represents how much heat can pass through a window, in either direction, and the SHGC rating represents the amount of solar radiation that can heat your home through the glass of the window. In Peoria, which is located in the Northern Climate Zone, all ENERGY STAR® approved windows must have a U-factor of 0.27 or less and any SHGC rating is believed to appropriate for the climate. It is true that Illinois experiences an above-average number of tornadoes each year, but experts are split on the benefits of investing in weatherproofing your windows. Even in Illinois, the chances are low your home will come in the path of a tornado, since severe weather is unpredictable and infrequent. The choice to weatherproof the windows of your home should be based on your own preferences, and what will make you feel most comfortable in your home. If you decide you would like to make the investment, storm shutters and high-impact glass can help protect your home if you do experience severe weather. As long as you are replacing your current windows with windows that are identically sized, the city of Peoria does not require you to apply for a home repair or renovation permit. If your window replacement project requires you to make changes to the surrounding wall, you will need to submit a permit application to the Department of Building Safety at 419 Fulton Suite 307, Peoria, Illinois, 61602. Any questions you have about permit requirements can be directed to the department, or you may be able to find an answer on their website here. Before you hire a contractor for the project, you will want to confirm they have a current general contractor’s license that allows them to make major home improvements in your state. It is also important that contractors carry both workers’ compensation insurance, to cover the cost if one of their employees in injured while working on your home, and general liability insurance, to cover the cost of any damage to your home or the contractor’s equipment if an accident occurs during the project. With the information provided above, you should easily be able to find windows that are appropriate for the climate in Peoria. These windows will improve the energy efficiency of your home, and could save you between $78 and $377 each year on your heating and cooling bills. The benefits of buying high quality windows extend beyond tightening your budgeting, you will also be lowering your footprint by decreasing your consumption of the nonrenewable energy used to heat and cool your home.